Each year we raise a small number of hogs in our woods. They live their entire life outdoors rooting through the undergrowth and soil for yummy nuts, grubs, and plants as pigs were meant to. They enjoy the shade of white pines in the summer heat and the warm sunshine of grass pastures. As they use the powerful muscles of their backs, necks and snouts they turn the soil over, creating muddy fields that we plant with pasture grasses for future flocks of chicken. 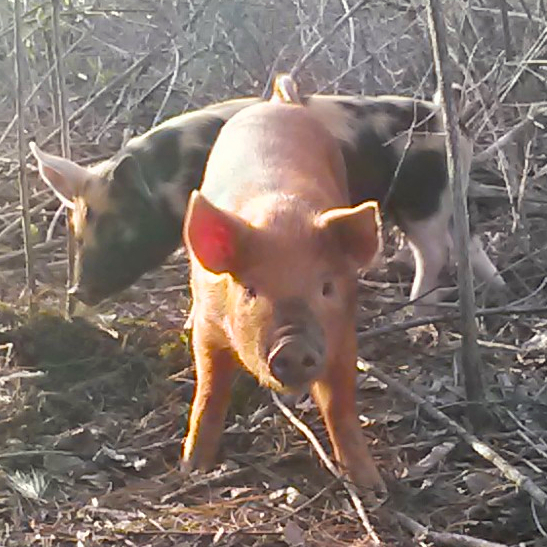 All the mud, fresh air, sunshine and room to roam, run and root makes for stress-free happy swine. 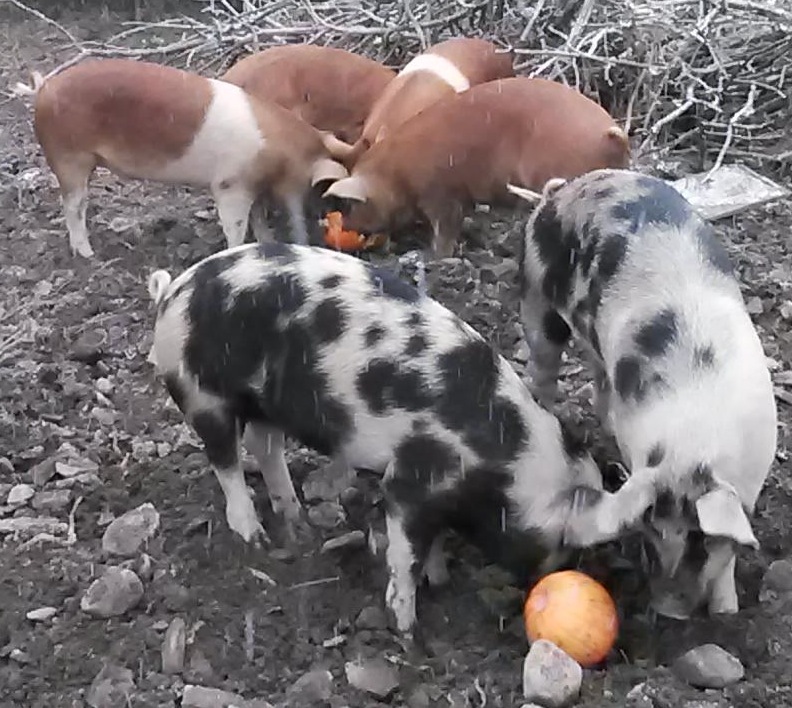 This nurturing and natural environment along with grain, cabbage, goat milk whey, hickory nuts, black walnuts, apples and pumpkins makes for healthy and tasty pork. If you have only known factory pork, our meats will make you reconsider what pork should taste like. If you grew up on homegrown pork, we’ll bring back memories as well as the pleasure of high quality meat. If the bargain meats of industrial hogs make you worry about what you feed yourself or your family, then cuts of pork from our pastured herd will bring you nutritious, complex meats that traditional farmers and discerning customers have enjoyed through the ages. You can order whole and half pigs butchered as you please. You pay a flat 6-dollar per pound rate for unsmoked, frozen shrink-wrapped cuts. Smoke products have an additional cost. You select what type of cuts you would like out of your half and we’ll deliver it for free. If you have never bought a half (or whole) hog and would like some guidance and have questions about how this works, please call or send us an email and we’ll readily explain. If you do not have freezer space for this much bulk meat, you may be able to rent space at the new Meat Lockers in downtown Corning and Ithaca. We offer a variety of sausage, smoked bacon and ham, pork chops, ham and shoulder steaks–and for those who wish–heart, liver, trotters, shanks, and tongue. If there is a custom cut you desire, contact us before we begin harvest and we may be able to accommodate. You can purchase our pork retail at local farmers markets. Farm visitors who make an appointment in advance receive a 50 cent per pound discount. Our products can be purchased most Saturdays and Sundays at the Ithaca Farmers Market. 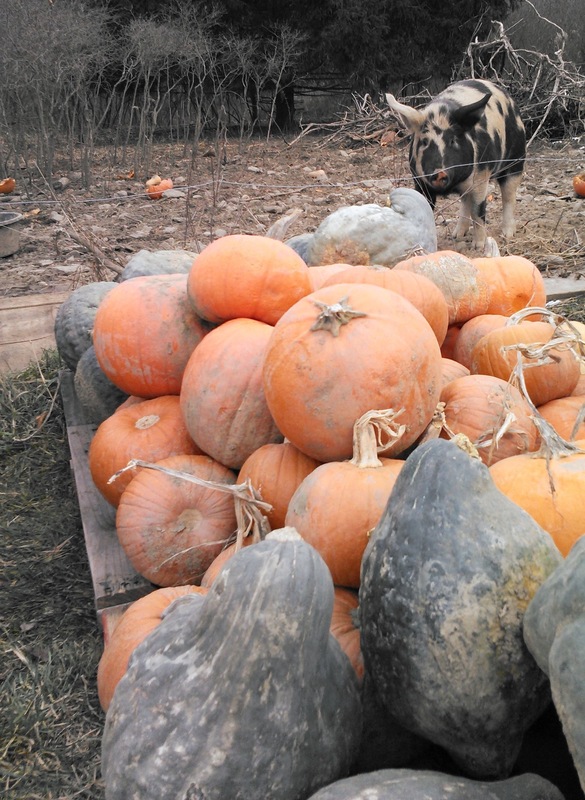 Thursday evenings from May through October we are the Montour Falls Farmers Market. On the first and third Saturdays from November through March at the Corning Indoor Winter Farmers Market. In the winter months we are also found on Sundays in the early afternoons at Chamberlain Acres in Elmira.